Despite the huge size of this pub, and the fact it’s stocked to the brim with some of the finest drinks available means you will feel relaxed and chilled out in this joint. 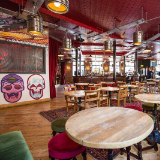 Head out the back to the spacious beer garden, crammed with booths and contemporary murals – you could easily wile away a few hours sampling all of the local ales and craft beers! The Hare and Hounds team keep their key kegs changing every week so you’ll always be spoilt for choice. And if you haven’t heard of La Choza, you simply must try their legendary authentic Mexican food, served from the H&H kitchen every day!